PG&E Plans To File For Bankruptcy Over Possible Liability In California Wildfires The utility says it could be facing tens of billions in liability costs connected to the 2017 and 2018 Northern California wildfires. PG&E also says its CEO is stepping down. California utility PG&E Corp. said Monday that it plans to file for bankruptcy over what it estimates could be $30 billion in potential liability costs from recent wildfires. 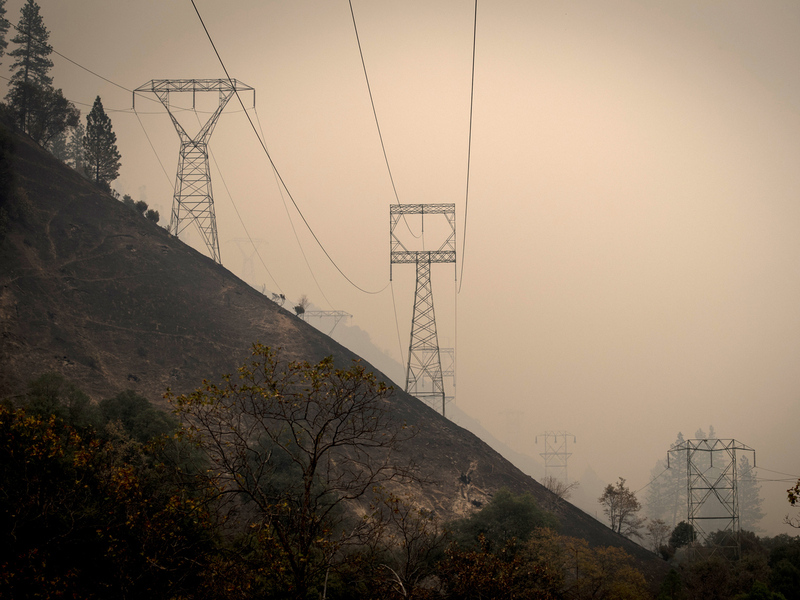 Here, transmission towers in a valley near Paradise, Calif., as the Camp Fire burns in November 2018. The state's fire agency, Cal Fire, determined in June that PG&E equipment had sparked 17 wildfires across Northern California in 2017. In 12 of those fires, the agency's findings were referred to the appropriate county District Attorney's offices for potential violations of state law. And regulators are now investigating the utility's potential culpability in November's Camp Fire, the deadliest in state history. If PG&E is found legally responsible for some or all of the costs connected to the 2017 and 2018 Northern California wildfires, its liability could exceed $30 billion, according to the company's filing with the Securities and Exchange Commission on Monday. And that figure does not include potential punitive damages, fines and penalties or damages related to future claims. "We believe a court-supervised process under Chapter 11 will best enable PG&E to resolve its potential liabilities in an orderly, fair and expeditious fashion," interim CEO John Simon, the company's general counsel, said in a statement. "We expect this process also will enable PG&E to access the capital and resources we need to continue providing our customers with safe service and investing in our systems and infrastructure." Shares of PG&E Corp. had plummeted more than 51 percent as of 3 p.m. ET on Monday. The company has lost more than two-thirds of its market value vanish since the Camp Fire, Bloomberg reports, and in November, Moody's downgraded its credit rating nearly to junk status. The company, based in San Francisco, is required by law to give 15 days' notice of bankruptcy. Electric and natural gas customers will not notice any change in service, the utility said. Between now and actually filing for Chapter 11, the state Legislature could take action to protect the company from 2018 fire liabilities. But given the raw anger directed at the utility, that might be politically impossible. Democratic state Sen. Jerry Hill, a longtime critic of PG&E who heads a key utility safety committee, said he'll work to see that any reorganization protects ratepayers and fire victims first. Hill said that if Monday's announcement is a company tactic to pressure the Legislature for a bailout, it won't work. "I certainly don't want to see another bailout for the fires of 2018," he said, "PG&E shareholders and bondholders ... invested and sometimes we make bad investments. And I think we should not be helping or assisting them nor giving golden parachutes to CEOs as well." As NPR's Eric Westervelt reported earlier this month, PG&E has been exploring whether to sell off its natural gas unit this spring in order to pay its bills: "All net proceeds from the sale of PG&E's gas division would be used to set up a fund to pay billions of dollars in potential claims from wildfires, the sources said ... The company also is exploring selling key real estate assets, including its San Francisco headquarters, and moving its operations elsewhere in the Bay Area, the sources say." The company's already significant financial problems only deepened following the Camp Fire in Butte County, Calif., in which at least 86 people died and tens of thousands were displaced. The California Department of Forestry and Fire Protection is still investigating the fire's cause, but PG&E says it experienced issues at part of its electrical system near where the fire broke out. Cal Fire says the Camp Fire began Nov. 8 at 6:33 a.m. local time on Pulga Road in Butte County — and PG&E sent an official notice to the California Public Utilities Commission describing an outage on one of its transmission lines at Pulga Road at 6:15 a.m. This would be the company's second bankruptcy filing in two decades. The utility's 2001 reorganization following widespread blackouts in the state led to a negotiated rate increase. Back then, the company painted itself as a victim of deregulation. But since then, the company has been convicted of felonies in a deadly gas line explosion, and now faces those potentially crippling wildfire liabilities and safety lawsuits. Mindy Spatt with the consumer group The Utility Reform Network says, this time around, bankruptcy for PG&E is very different. The company's problems stem from what she called its practice of putting profits ahead of safety. "The debt that PG&E is talking about is debt that arises directly from its own negligence and liability," Spatt said. "It's a longstanding principle of utility law that customers don't pay for that kind of thing." "California's existing liabilities laws weren't made for the new normal that we face going forward with these climate driven wildfires," Steve Malnight, a senior vice president at PG&E, told NPR member station KQED in August. "It's creating really significant financial risk to the utilities which will limit our ability to continue making the investments we need going forward." PG&E's decision to replace its chief executive is likely intended to satisfy state regulators rather than investors, said Paul Patterson, an analyst who follows PG&E at Glenrock Associates LLC. "Making management changes is something the state is looking for, and handing the head of the CEO might placate the state," he told The Wall Street Journal. Williams was at the helm of PG&E for less than two years, and was the first Latina CEO of a Fortune 500 company, the San Francisco Chronicle reports. According to Monday's SEC filing, the company is aware of about 50 complaints on behalf of at least 2,000 plaintiffs over its possible role in the Camp Fire, including six that seek to be class-actions. PG&E says it is also aware of approximately 700 complaints on behalf of at least 3,600 plaintiffs related to the 2017 Northern California wildfires, five of which seek class-action status. Last week, a federal judge proposed requiring PG&E to re-inspect its entire electric grid and "remove or trim all trees that could fall onto its power lines." During the 2019 wildfire season, the company would also be required to turn off power in parts of the grid if windy conditions make them unsafe.